Third-party security has been at the center of attention on our campus since the beginning of this 2017-2018 academic year. As a leader of the Class of 2018, a sorority woman, friend, and concerned student, I have been part of the complex and continuous dialogue surrounding this issue. Personal anecdotes from students detailing examples of gross misconduct by third-party security have been commonplace in this dialogue within the student body. Since entering this community in 2014 I have witnessed the implementation of many policies, crafted with the goal of maximizing safety, that have directly impacted fraternities’ social gatherings. The goal of ensuring the safety of students who participate in fraternity-planned social events is essential and should be achieved, especially amidst the contemporary landscape of fraternities and sororities across our country. However, our means of ensuring the safety of our students has been flawed. As an institution that prides itself on community, there should be no reason why repeatedly voiced student concerns regarding an outside vendor did not bring about action from the administration. It was not until a student-led investigation into the vendor was brought to light that any concrete change took place. Our history with another third-party security vendor followed a similar pattern. As an institution it is imperative that the administration acknowledges its history of missteps in the hope of finding a solution that does not repeat a broken past. Students of my class year and those before us can recall the College’s former contract with the Chameleon Club Security Company. 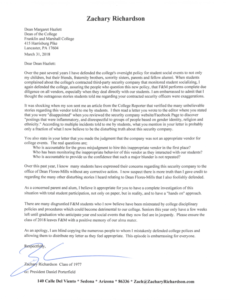 A recent 2017 F&M graduate remarked on this former collaboration, expressing complaints and examples of misconduct from students about that security company to our administrators. The administration responded by saying that we had to use that security vendor because they were the only ones willing to accept the risk of ensuring safety at F&M parties. Following the termination of our contract with that security vendor, history has indeed repeated itself. How will the administration prevent this from happening again? Zachary Richardson, an active member of our community as an alum and a parent, wrote a letter to our Dean of the College, Dean Hazlett. The views expressed in this letter and by students, administrators, parents, and alumni, are a testament to our passion on issues that affect us. Our termination of the services of MProtective is a first step in the right direction toward finding a solution that promotes the safe exercise of social outlets while ensuring that those social outlets exist to serve a diverse array of our student body who wish to utilize it. In the case of solving this issue, there are lessons to be learned that hold implications for the future of F&M. I look forward to working together to find a balanced solution that positively benefits all members of our community.